Welcome to the UBNT Shop (UBNTShop), Australia's leading suppliers of Ubiquiti Networks products. UBNT Shop buy Ubiquiti products in bulk quantities so that we can pass on the savings to you. Find competitive prices on the complete Ubiquiti range including IniFi Wireless, UniFi Video, UniFi Switches, airMax Radios & Antennas, airFiber, Ubiquiti Fiber & airFiber Backhaul Radios & Antennas. 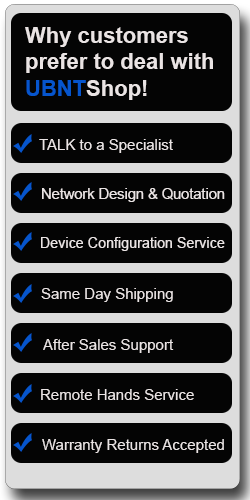 QUALIFIED INSTALLER & CABLERS Looking for a qualified Ubiquiti Installer in your area. Find an Installer here or send us your details to be reviewed for listing on our website installers directory.